Payroll Mate® makes processing chiropractic office payroll easy and affordable. Our payroll system offers many features that can cater to the special payroll processing needs of chiropractors. Since Payroll Mate® supports multiple pay frequencies and pay types, you will be able to fulfill payroll for any type of employee. Operating a chiropractic practice can be challenging but rewarding in that you can help your patients be relieved of their pain. Whether you operate a small practice or a large practice with multiple chiropractors, it is important to have a good payroll software program in place. Payroll Mate® allows chiropractic offices to administer their payroll with complete confidence. • Getting started with Payroll Mate® is simple. Take advantage of friendly customer support via email, telephone, or chat. • Step by step wizards and tutorials are also available to ensure you get off to the right start. • Do you have employees working in your chiropractic office that are paid based on different pay types or even on different frequencies? Hourly, salary, and many more pay types are supported for employees that can be paid daily, weekly, bi-weekly, semi-monthly, and monthly. • Payroll Mate® gives you the ability to pay your employees in the manner that is easiest and most appropriate for your practice. • Payroll Mate® makes calculating payroll taxes easier since this program automatically calculates State and Federal withholdings, Social Security, Medicare, and net pay. • Unlimited user-defined payroll deduction, income, and tax types can be created. • Once payroll checks are created, you can choose to print traditional signature-ready payroll checks or take advantage of direct deposit payroll for the convenience of your practice and your employees. Direct deposit is an additional cost add-on feature to Payroll Mate®. • Vacation and sick leave time can be accrued and tracked easily with Payroll Mate®. • Offers a powerful data import engine for employee payroll setup and other information such as name and address. • Offers the ability to export payroll data to accounting program such as Quicken, QuickBooks, Peachtree Sage 50, and General Ledger. • The program supports a variety of quarterly and annual payroll forms, including 940, 941, 943, 944, W-2 and W-3. The forms are prepared ready to sign and send, saving your payroll administrator a significant amount of time and hassle. • Along with preparing payroll and meeting reporting requirements, your office may also have the need access various payroll details from time to time. • Some reports supported by Payroll Mate® include Journal Detail, Journal Summary, Tax Liability, Employee Earnings, Deposit Requirements, Taxes and Deductions, and many more. • As a health practitioner, you understand how important it is to keep sensitive information safe. The same is also true for confidential payroll information. • With Payroll Mate®, you can take advantage of the option to implement a password requirement. This option requires the user to enter a password before being able to access confidential payroll data. • You can also choose to hide confidential information, such as Social Security numbers on printed pay stubs. • You also do not need to worry about potentially losing valuable payroll data with Payroll Mate®, as the program provides a prompt to remind users to backup data at the end of each day. • Since Payroll Mate® is an in-house payroll system, you do not need to worry about your employee’s payroll data being hosted online. 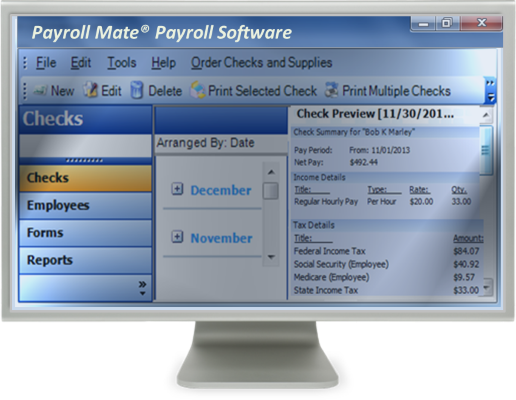 • Payroll Mate® will also work with a variety of Windows operating systems. The program will also work with Mac if you utilize a virtualization technology, such as Parallels Desktop. Administering payroll for a chiropractic firm can deliver its own unique set of challenges, but with the right payroll program, you can ensure that your payroll is administered easily and efficiently.